Marry Me! 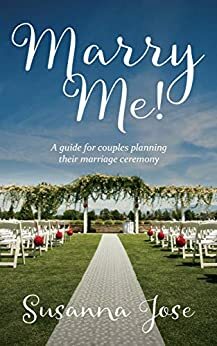 A guide for couples planning their marriage ceremony is an inclusive little book which helps couples plan a personal, meaningful marriage ceremony, whether they are young, old, first timers or those marrying again with blended families. Written in the year following the advent of marriage equality, it explains the legalities of getting married in Australia. You’ll find out what you need to do, what forms you need to fill out, what documents you need, who is able to conduct your marriage and the time frame in which you can have the marriage solemnised after you sign your Notice of Intended Marriage. Marry Me! gives couples permission to include the traditions they like, discard gender stereotypes, start new traditions like having their fur baby as the best man. The book focuses on the marriage ceremony, the part where you become a married couple, rather than the wedding trimmings like the suits and dresses, the reception, cars and cake. There are tips on planning – from your big decision through to the rehearsal – including choosing a celebrant, deciding on the type of ceremony, location, time of year. One chapter helps couples deal with some of the dilemmas and tricky issues they may face in planning a wedding – the choice of religious or civil ceremony, who to invite and exclude, dealing with the expectations of others and costs for attendants. The chapter on vows gives advice on how to personalise the marriage vows which are added to the legal ones, by explaining all the vows and promises included in the marriage ceremony and giving a step by step guide to how to write your own. The place of music in the marriage ceremony, is explained showing where music fits, the pros and cons of live or recorded music and the importance of the music operator. Music choice suggestions in the genres of Classical, Twentieth century and contemporary music are given. Similarly, a chapter on readings includes helpful examples from poetry, literature and film with some tips on delivery. Marry Me! is full of ideas to help you make your marriage ceremony personal, meaningful, and memorable along with descriptions of some of the rituals and symbols which can be included, like the giving of rings, ring warming, handfasting, unity candles and the blending of coloured sands to represent the merging of two families. Marry Me! gives tips on choosing your photographer, working out what you want photographed or recorded, unplugged ceremonies, sharing on social media, using drones and skyping the ceremony. You’ll learn what’s covered in the wedding rehearsal, who should be there and how the important moments (the entry, rings and kiss) will occur. There’ll be a chance to practise the grand entry and exit. The final chapter includes three sample ceremonies to demonstrate how different ceremonies can all meet the legal requirements and still be constructed to reflect the needs and wishes of the couple getting married. Marry Me! has examples, anecdotes and suggestions throughout which are inclusive of all different sorts of couples and there is a strong emphasis on marriage ceremonies which are not gender stereotypical. Susanna Jose trained as a Commonwealth marriage celebrant in 2013 after a teaching career in three states and territories, as an early childhood teacher, adviser and for nineteen years, a school principal. In both education and celebrancy, Susanna recognised the importance of celebrating the milestone moments in life. She has conducted numerous namings, renewal of vows ceremonies, funerals, and mainly finds herself solemnising the biggest milestones of all - marriage ceremonies. Growing up south of Adelaide in South Australia, Susanna spent ten years in Darwin and now lives in Canberra with her husband. Four daughters and their families including four grandchildren live in, or within a few hours from Canberra. Susanna continues to mentor and support teachers and aspiring school leaders and is a regular RSPCA volunteer.